Paramore is an American rock band from Franklin, Tennessee, formed in 2004. The band currently consists of lead vocalist Hayley Williams, guitarist Taylor York and drummer Zac Farro. The group released its debut album All We Know Is Falling in 2005, with the album reaching number eight on the UK Rock Chart and number thirty on Billboard's Heatseekers Chart. While it only had a minimal commercial performance initially, the album and its lead single "Pressure" were eventually certified Gold by the RIAA after the success of the band's later material. In 2002, at age 13, vocalist Hayley Williams moved from her hometown Meridian, Mississippi to Franklin, Tennessee, where she met brothers Josh Farro and Zac Farro at a weekly supplemental program for home-schooled students. Shortly after arriving, she began taking vocal lessons with Brett Manning. Prior to forming Paramore, Williams and bassist Jeremy Davis, along with friend Kimee Read, took part in a funk cover band called The Factory, while Josh and Zac Farro had practiced together after school. The other members of what was soon to be Paramore had been "edgy about the whole female thing" of having Williams as vocalist, but, because they were good friends, she started writing for them. Williams said of the members when she first met them, "They were the first people I met who were as passionate about music as I was." The band was officially formed by Josh Farro (lead guitar/backing vocals), Zac Farro (drums), Davis (bass guitar) and Williams (lead vocals) in 2004, with the later addition of Williams' neighbor Jason Bynum (rhythm guitar). When Davis showed up, he was stunned to find out the drummer was only twelve years old. He admitted "I had very, very, very, little faith in everyone in the band because of their age. I remember thinking, 'This is not going to work because this kid is way too young,' but that first day of practice was amazing. I knew we were on to something." According to Williams, the name "Paramore" came from the maiden name of the mother of one of their first bass players. Once the group learned the meaning of the homophone "paramour" ("secret lover"), they decided to adopt the name, using the Paramore spelling. Williams was originally signed to Atlantic Records as a solo artist in 2003. She had been introduced to Atlantic A&R Tom Storms through Kent Marcus and Jim Zumwalt, lawyers of managers Dave Steunebrink and Richard Williams, and then eventually signed to Atlantic by Jason Flom. Steunebrink and Richard Williams had originally discovered and signed her to a production deal that was later bought out by Atlantic. The original plan of the label was to turn her into a pop singer, but Williams resisted, saying that she wanted to play alternative rock music with a band. In an interview with HitQuarters the band's A&R at Atlantic, Steve Robertson, said, "She wanted to make sure that we didn't look at her as some straight to Top 40 pop princess. She wanted to make sure that she and her band got the chance to show what they can do as a rock band writing their own songs." Label president Julie Greenwald and the label staff decided to go with her wishes. The original management team for the band was Dave Steunebrink, Creed manager Jeff Hanson, and Hanson's assistant Mark Mercado. Paramore was originally supposed to release their music on Atlantic Records, but the label's marketing department decided it would be better for the image of the band to not have them attached to a major label. Instead, they released their music through the niche label Fueled by Ramen. Lyor Cohen, the head of Warner Music Group, had already identified Fueled by Ramen as a label they should partner with. It was decided the rock label would make an ideal match for Paramore. According to Robertson, when the band were presented to Fueled by Ramen's CEO John Janick, "he got the vision of the band immediately." Janick went to a Taste of Chaos performance in Orlando, Florida to see the band perform live. In April 2005, after a smaller private performance at a warehouse, the band was signed to Atlantic Records and Fueled By Ramen. The band's first song written together was "Conspiracy", which was later used on their debut album. At this time, they were touring the southeast, usually being driven by Williams' parents. She commented that "Back then, I guess we were all thinking, after school we'll go to the house and practice. It was what we loved to do for fun, and still do! I don't think any of us really knew this would turn out to be what it's become." Before touring, the band added John Hembree (bass) to their lineup to replace Davis. 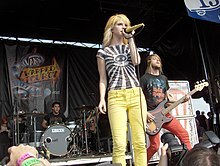 During that summer, Paramore was featured on the Shira Girl stage of the 2005 Warped Tour. After being asked by the band, Jeremy Davis returned to Paramore after five months apart, replacing Hembree. All We Know Is Falling was released on July 24, 2005, and reached No. 30 on the Billboard's Heatseekers Chart. Paramore released "Pressure" as its first single, with a video directed by Shane Drake, but the song had failed to chart. The video featured the band performing in a warehouse, eventually getting sprayed with water sprinklers as the storyline of a conflicted couple occurs. In July, "Emergency" was released as the second single, the video again reuniting the band with director Shane Drake and featuring Hunter Lamb (rhythm guitar), who replaced Jason Bynum in December 2005. The video for "Emergency" showcased Paramore in another performance, this time fixing the members' bloody costumes. The third single, "All We Know", was released with limited airtime, with the video consisting of a collection of live performances and backstage footage. After the band's later success, All We Know Is Falling and "Pressure" were certified Gold by the RIAA. The band toured with Jimmy Eat World in the United States in April and May 2008. The band headlined the Give It A Name festival in the United Kingdom on May 10 and May 11, 2008. Also the band performed on the In New Music We Trust Stage at Radio 1's One Big Weekend in Mote Park, Kent on May 10, 2008. Paramore played their first Ireland show at the RDS in Dublin on June 2, 2008, followed by the 2008 Vans Warped Tour from July 1–6. In January 2009, Josh Farro spoke about the band's next studio album. Talking to Kerrang!, Farro said: "We're gonna try to it in Nashville. I think writing the album there will inspire us, and then if we record there too it'll be a lot easier since we can sleep in our beds at night rather than in hotels like the other 300 days out of the year! We're not sure who's going to produce the record yet. We did "Decode" with Rob Cavallo, which was a good experience, but we're looking around and don't want to make any decisions until we have a lot of songs and we know what we're looking for. We really enjoy our live sound and we want a producer who can really capture that." Paramore wrote and completed their third album Brand New Eyes in early 2009. The first single from the album was "Ignorance" and was released July 7, 2009. 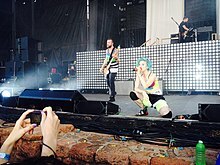 Paramore was the special guest with Bedouin Soundclash, The Sounds and Janelle Monáe at the No Doubt Summer Tour 2009, starting in May 2009 in outdoor amphitheaters and arenas across the US and Canada. The official music video for "Ignorance" aired on all MTV platforms, networks, and websites on August 13, 2009. 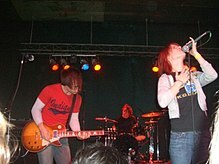 Paramore, along with Paper Route and The Swellers, toured in support of Brand New Eyes in the fall of 2009. Some tour dates were postponed due to Hayley Williams becoming infected with laryngitis. "Brick By Boring Brick", "The Only Exception", "Careful" and "Playing God" were the album's following singles. To promote the album, the band recorded a performance for MTV Unplugged. On December 18, 2010 a message from Hayley, Jeremy, and Taylor was released through Paramore.net stating that Josh and Zac were leaving the band. The band also confirmed the scheduled South American tour would still happen. Josh Farro wrote a statement on the departure on his Blogger, claiming that the band was "a manufactured product of a major-label." He accused Hayley Williams of being manipulated by her management, treating the rest of the group as her solo project, and claimed she was the only member of the band who was signed to Atlantic Records, while her bandmates were simply "riding on the coattails of her dream". On December 30, 2010, MTV News interviewed Williams, York and Davis in Franklin, Tennessee regarding their reactions to Farro's response. The interview aired on MTV.com on January 7, 2011 as Paramore: The Last Word. While the band confirmed many of Farro's statements, notably that Williams was indeed the only member of the band actually signed to Atlantic, they said they felt the statement was irrelevant, adding that they had addressed many of the claims made already throughout the course of their career. On January 10, 2011, in an interview with MTV, Hayley Williams said that despite the band losing two of its founding members, they would release new music in 2011, although they had not confirmed if it would be a full album for release, or just a small number of songs. The singer also admitted that Paramore's style was likely to change with the new lineup, but clarified that the band would still retain their core signature sound. The band entered the studio upon returning from their South American tour to record a batch of songs that were released over the summer, prior to their fourth full-length album. One of the songs included "In the Mourning", which Williams debuted on her Tumblr page. Paramore later confirmed they were entering a studio in Los Angeles with producer Rob Cavallo to record what would be the Singles Club. On June 9, 2011, Hayley Williams announced that the band had started to write their fourth album, which they hoped to start recording at the end of the year, with an early 2012 release. On September 5, 2011, Hayley Williams confirmed the release of another new song, titled "Renegade", which was recorded at the same time as "Monster." On October 11, 2011, Paramore announced that they would release a new song for each of the remaining months of 2011. The band set up the Singles Club on their website which gave fans the chance to purchase the singles when they were released, as they were released exclusively through the Singles Club and were therefore not sold elsewhere. A song called "Renegade", premiered the day of the announcement, with "Hello Cold World" following on November 7 and "In the Mourning" on December 5. On December 14, 2015, bassist Jeremy Davis left the band. In March 2016, Davis embroiled in a legal battle with Paramore, claiming to be eligible to enjoy the benefits of a business partnership with Hayley Williams as a co-owner of the band. Davis reached a settlement with the band in May 2017. On January 19, 2016, Williams announced over Twitter that the band was in the process of writing their fifth album. On June 8, 2016, the band posted a short video of themselves in a studio to their social media. This was preceded by a number of images which all included both former drummer Zac Farro and producer Justin Meldal-Johnsen, leading fans and various media outlets to speculate the return of Farro. On June 17, Farro was featured yet again in a picture uploaded to social media, this time behind a drum set, confirming that he would be recording drums for the album, though he later clarified that he was only recording drums for the album and that he had not rejoined the band as a full member. Despite this, on February 2, 2017, the band announced that Farro will return as the official drummer of the band. Paramore's music style has generally been regarded as alternative rock, pop punk, pop rock, power pop, emo pop, and emo. Joshua Martin had written after an interview with Hayley Williams, "The band isn't just a short pop-punk girl with red hair and a spunky attitude. Their music is like them, it's aged differently. It's sped up, and slowed down. It's emo without being whiny, or bratty. Almost a very literal anti-Avril Lavigne." Alternative Press magazine had commented that the band was "young sounding", while consistently being "honest." Paramore's first album All We Know is Falling had an arguably more "formulaic pop-punk" sound that was "delivered particularly well" and the combination of the two had created a "refined rock infused pop/punk album." The band's second release, Riot! was said to explore a 'diverse range of styles," however, not straying far from "their signature sound." Paramore has expressed appreciation for Fall Out Boy, Hanson, Panic! at the Disco, Blink-182, Death Cab for Cutie, Jimmy Eat World, MewithoutYou, and Sunny Day Real Estate, as well as Thrice and New Found Glory; Hayley Williams has cited her personal influences as Elvis Presley, the Shirelles, the Angels, the Ramones, Blondie, Aaliyah, Robert Smith of The Cure and Etta James. Williams named many singers as heroines: "I love Debbie Harry and Siouxsie Sioux. I grew up listening to The Distillers [...] Girl groups are really important to me, but the Shangri-Las especially". Williams also explained that bands such as U2, "who are massive, and do whatever they want, write whatever they want and they stand for something," Jimmy Eat World, "who I don’t think ever disappoint their fans," and No Doubt, who "have done amazing things," act as a pattern for the path in which Paramore would like to take their career. In 2012, Williams contributed vocals to MewithoutYou's fifth studio album, Ten Stories. The band members are Christians and in an interview with the BBC, Josh Farro stated "Our faith is very important to us. It's obviously going to come out in our music because if someone believes something, then their world view is going to come out in anything they do. But we're not out here to preach to kids, we're out here because we love music." In June they were declared by Rolling Stone as "Ones to Watch". Paramore made their live television debut on Fuse Networks daily show, The Sauce. The second single from Riot!, "Hallelujah", was released on July 30, 2007, and is only available online and on UK television. The video, much like "All We Know", features backstage footage and live performances. In March 2008, Paramore made its first rhythm game appearance with "Crushcrushcrush" as a downloadable track in the Rock Band games and later being a playable song in Guitar Hero On Tour: Decades. Later that year, Rock Band 2 was released with the song "That's What You Get" included as a playable track. The video game Guitar Hero World Tour featured the song "Misery Business" along with Hayley Williams participating in motion capture sessions for the game. She is featured as an unlockable character in the game as well. "Misery Business" was also featured as a playable track on Rock Band 3, while "Pressure", "The Only Exception", "Brick by Boring Brick", and "Ignorance" are available as DLC for the game. In 2015 The song "Still Into You" was featured as an on disc song for Rock Band 4. The music video for "Decode", along with the Twilight film trailer, was shown in the North American Home Theater of PlayStation Home from December 11, 2008 to December 18, 2008. ^ Caulfield, Keith (2009-10-07). "Barbra Streisand has ninth No. 1 album". Hollywoodreporter.com. Archived from the original on October 24, 2012. Retrieved 2010-08-18. ^ "Paramore Album Debuts At #1". FueledByRamen.com. 2013-04-17. Retrieved 2013-04-26. ^ a b c Leahey, Andrew. "Biography". Allmusic. Retrieved 2007-08-16. ^ Hayley Williams (2007-10-17). "Youth Gone Wild" (Interview). Interview with David Walter. Retrieved 2010-09-26. ^ a b Hayley Williams; Josh Farro (2007-06-26). "ASL's Exclusive Interview With Paramore" (Interview). Interview with Joshua Martin. Retrieved 2011-06-09. ^ a b Josh Farro; Hayley Williams; Jeremy Davis (2007-07-14). "Interview With Paramore" (Interview). Interview with cathyreay. Archived from the original on 2009-04-13. Retrieved 2011-06-09. ^ "History". paramore.net. Retrieved 2007-12-31. ^ Paramore. "Hello My Name Is" (Interview). Retrieved 2009-06-11. ^ a b c "Interview with Jeff Hanson". HitQuarters. 20 September 2010. Retrieved Oct 7, 2010. ^ a b c d "Interview With Steve Robertson". HitQuarters. 9 Nov 2009. Retrieved 17 May 2010. ^ a b c Hayley Williams; Josh Farro (2005-08-08). "Interview: Hayley Williams and Josh Farro of Paramore" (Interview). Interview with Tony Pascarella. Archived from the original on February 13, 2007. Retrieved 2007-08-16. ^ Hayley Williams (2005-07-14). "Paramore Interview" (Interview). Interview with Jason Schleweis of Crush Music Mag. Retrieved 2007-10-12. ^ "Paramore Kerrang! Article". Kerrang!. 2006-11-05. Retrieved 2007-10-13. ^ "October Fall – A Season in Hell". AbsolutePunk.net. Retrieved 2007-08-18. ^ "It's a Bird, It's a Plane, It's Sound of Superman" (Press release). Rhino. 2006-03-23. Retrieved 2007-08-18. ^ a b c "Paramore". mtv.com. Retrieved 2007-08-18. ^ a b Fletcher, Alex (2007-09-24). "Paramore". fueledbyramen.com. Retrieved 2007-08-18. ^ "Paramore Not Happy About Kerrang Article". drivenfaroff.com. 2007-05-31. Retrieved 2007-10-13. ^ "God Makes Real Noise". PopMatters.com. Retrieved 2007-08-18. ^ Karan, Tim (December 22, 2010). "Josh Farro "finally tells the truth" about Paramore". Alternative Press. Retrieved August 7, 2016. ^ a b c Hayley Williams; Josh Farro (2007-05-25). "Paramore" (Interview). Interview with Julia Conny. Retrieved 2007-10-13. ^ "redemption. it's a long story.". livejournal.com. 2007-06-27. Retrieved 2007-10-12. ^ "Paramore <Paramore>". bebo.com. 2007-10-12. Retrieved 2007-10-14. ^ "Say Anything To Post New Song". absolutepunk.net. 2007-10-01. Retrieved 2007-10-15. ^ "Paramore". altpress.com. February 2008. Retrieved 2008-01-04. ^ "50th Annual Grammy Awards Nominations List". Grammy.com. Retrieved 2007-12-06. ^ "Tours: Paramore / New Found Glory (UK)". punknews.org. 2007-10-22. Retrieved 2007-11-01. ^ "Paramore upcoming shows". Paramore.net. 2007-12-02. Retrieved 2007-12-02. ^ "inTuneMusic: Paramore in Asbury Park". ^ "Announcing Paramore's Fall Tour, Presented By Paramore.net! – Blog Detail". Paramore.net. 2009-08-12. Retrieved 2010-08-18. ^ "Tour Dates Postponed. – Blog Detail". Paramore.net. 2009-10-02. Retrieved 2010-08-18. ^ "Paramore's 'Brick By Boring Brick' Video Is No Happily Ever After – News Story | Music, Celebrity, Artist News | MTV News". Mtv.com. 2009-11-24. Retrieved 2010-08-18. ^ "Paramore - The Only Exception (single)". Adelaide.citysearch.com.au. 2010-02-21. Retrieved 2011-12-10. ^ Praxis Media. "Radio1 Rodos Greece ::: UK Forthcoming Singles ::: Charts, DJ Promos, Dance, Lyrics, Free Mp3 Samples Downloads". Radio1.gr. Retrieved 2010-08-18. ^ "Unplugged". MTV. Retrieved 2010-08-18. ^ "Paramore". Wcms-uk.warner.delivery.warner.b5.d9tcloud.de. 2009-08-21. Retrieved 2010-08-18. ^ "Paramore @ Wembley Arena – Reviews – Music". Virgin. 2010-01-04. Retrieved 2010-08-18. ^ "paramoreband: A note from Josh". Paramoreband.livejournal.com. Retrieved 2010-08-18. ^ "Paramore's Hayley Williams Talks Josh Farro's Wedding Plans". wpparty.com. 2010-03-08. Retrieved 2010-08-18. ^ "Green Day News | Opening acts to support summer UK tour". Greendayauthority.com. 2010-03-18. Retrieved 2010-08-18. ^ "2010 Honda Civic Tour Presents Paramore in Concert". Civictour.honda.com. Retrieved 2010-08-18. ^ "Paramore Tickets". Allgigs.co.uk. Retrieved 2010-08-18. ^ "2011 South American Tour (Updated) – Blog Detail –". Paramore.net. 2010-12-02. Retrieved 2011-08-12. ^ Ziegbe, Mawuse (2010-12-11). "Paramore Taking A Break In 2011 To Record New Album – Music, Celebrity, Artists News". MTV. Retrieved 2011-08-12. ^ a b "ANNOUNCEMENT – Blog Detail –". Paramore.net. 2010-12-18. Retrieved 2011-08-12. ^ a b "Paramore Confirm Farro Brothers Have Left Band – Music, Celebrity, Artists News". MTV. 2010-12-18. Retrieved 2011-08-12. ^ Montgomery, James (2010-12-22). "Paramore Split Gets Nasty: Josh Farro Calls Former Band 'A Manufactured Product' | News". MTV. Retrieved 2015-09-09. ^ "Exclusive: Paramore React To Josh Farro's 'Exit Statement' – Music, Celebrity, Artists News". MTV. 2011-01-04. Retrieved 2011-08-12. ^ "Paramore: The Last Word | Full Episodes, Photos, Episode Synopsis and Recaps". MTV. Retrieved 2011-08-12. ^ "Paramore To Release New Music This Year". Ultimate-guitar.com. Retrieved 2011-08-12. ^ "Paramore To Release New Music This Summer | News @". Ultimate-guitar.com. Retrieved 2011-08-12. ^ Volledige naam. "Twitter". Twitter. Retrieved 2013-03-15. ^ "'Monster' World Premiere! - Blog Detail". Paramore.net. 2011-06-03. Retrieved 2011-07-06. ^ "Paramore to release new album in early 2012 | News". Nme.Com. 2011-06-09. Retrieved 2011-07-06. ^ "Paramore To Release Three New Singles | News". Ultimate-guitar.com. Retrieved 2011-10-15. ^ "Finally, an update from Paramore". Paramore. Retrieved 2012-05-06. ^ "Paramore Recruit Ex-NIN Drummer | News @". Ultimate-guitar.com. Retrieved 2012-07-19. ^ "4th Album Announcement - Paramore Official Blog". Retrieved 2012-12-07. ^ "Paramore release lyric video for new song, "Still Into You" - Alternative Press". Alternative Press. 2013-03-14. Retrieved 2013-04-04. ^ "Watch: Paramore Unveil 'Daydreaming' Video | News | DIY". Thisisfakediy.co.uk. Retrieved 2013-11-05. ^ "Paramore's "Ain't It Fun" Goes Platinum". Alter The Press. 2014-06-18. Retrieved 2013-06-18. ^ "'Ain't It Fun' Grammy Nomination!". paramore.net. 2014-12-05. Retrieved 2014-12-07. ^ "Paramore: Writing The Future"
^ "Paramore - These last few years have held some of the most... - Facebook". Retrieved December 15, 2015. ^ Rettig, James (12 May 2017). "Paramore Settle Legal Dispute With Former Bassist Jeremy Davis". Spin. Retrieved 13 May 2017. ^ "Instagram video by Paramore • Jun 8, 2016 at 10:29pm UTC". Instagram. Retrieved 2016-06-14. ^ "Paramore (@paramore) • Instagram photos and videos". www.instagram.com. Retrieved 2016-06-14. ^ "What are Paramore doing with...". news.google.com. Retrieved 2016-06-14. ^ "Instagram photo by Paramore • Jun 17, 2016 at 6:13pm UTC". Instagram. Retrieved 2016-06-23. ^ Payne, Chris (2 February 2017). "Rejoice, Paramore Fans: Drummer Zac Farro Is Back in the Band". Billboard. Retrieved 3 February 2017. ^ "[PRE-ORDER] After Laughter CD | Warner Music Canada". Store.warnermusic.ca. 2017-03-29. Retrieved 2017-04-21. ^ "Here's Everything We Know About Paramore's New Album After Laughter". May 3, 2017. Retrieved May 3, 2017. ^ John J. Moser (2013-07-22). "Paramore, chart-topping alt-pop/rock band, to play Sands Bethlehem Event Center - Morning Call". Articles.mcall.com. Retrieved 2013-12-25. ^ a b Zaleski, Annie (2013-04-09). "Paramore: Paramore · Music Review · The A.V. Club". The A.V. Club. Retrieved 2014-07-31. ^ "Paramore brings new sound to KeyArena tonight - Concert preview". Retrieved June 17, 2016. ^ Ryzik, Melena (2013-04-12). "Hayley Williams of Paramore on Her New Album". The New York Times. ^ "Fall Out Boy and Paramore to perform at Hersheypark Stadium". PennLive. 2014-07-15. Retrieved 2014-07-31. ^ Ramanathan, Lavanya. "Lauryn Hill, the Jingle Ball and more top December concerts". Washingtonpost.com. Retrieved 2014-05-29. ^ Ableson, Jon (2009-08-20). "Paramore talk about progress of their next record". Alter The Press!. Retrieved 2014-05-29. ^ "Paramore Riots At Chevrolet". Retrieved June 17, 2016. ^ Phull, Hardeep (10 November 2013). "After a rough patch, things are looking up for Paramore". Retrieved June 17, 2016. ^ "Familiar With Emo, Intimate With Upbeat". New York Times. 2007-11-30. Retrieved 2008-01-05. ^ Josh Farro; Jeremy Davis. "Interview: Paramore" (Interview). Interview with Charlotte Otter. Retrieved 2007-10-13. ^ a b Davies, Alex. "Paramore – Riot!". decoymusic.com. Archived from the original on 2007-11-03. Retrieved 2007-10-13. ^ Schleweis, Jason (2005-07-26). "Paramore". Retrieved 2007-10-13. ^ "Bamboozle Recap: Day 1". altpress.com. 2007-05-06. Retrieved 2007-10-13. ^ Mayer, John (2007-10-27). "Paramore". honeyee.com. Retrieved 2007-11-01. ^ Pascarella, Tony (2007-07-20). "Music Review: Paramore, "All We Know Is Falling"". the-trades.com. Retrieved 2007-10-13. ^ Drumm, Alex. "Paramore". emotionalpunk.com. Archived from the original on 2007-06-09. Retrieved 2007-10-13. ^ Bradley, Jonathan (2007-08-13). "Paramore – Riot! – Review". stylusmagazine.com. Retrieved 2007-10-13. ^ "Review". nme.com. Retrieved 2007-10-13. ^ a b "Paramore in prog shock rock?". citylife.co.uk. Retrieved 2011-06-09. ^ "Paramore's official bio". paramore.net. ^ "Questions and Answers with Paramore". paramore-fans.com. 2007-09-19. Retrieved 2007-10-13. ^ Paramore bbc interview (2008-02-06). "Talking Shop: Paramore". BBC News (Interview). Retrieved 2010-01-03. ^ "Warped adds Agent Orange, video from Rock'n'Roll Hall of Fame exhibit". punknews.org. 2007-02-09. Retrieved 2007-08-18. ^ Moseley, Brittany (2007-01-31). "Warped Tour: Thirteen years of memorabilia to Cleveland". Stater Online. Retrieved 2007-08-18. ^ "Paramore". rollingstone.com. Retrieved 2007-10-13. ^ "Behind the Scenes: Paramore's TV Spots". mtv.com. Retrieved 2007-08-18. ^ "MTV Doesn't Care About Black People, Either". mollygood.com. 2007-09-11. Archived from the original on 2007-09-15. Retrieved 2007-08-13. ^ "i forgot to tell you guys. i'm such a jerk!". livejournal.com. 2007-09-27. Retrieved 2007-10-09. ^ "Tours: Paramore / The Swellers / Paper Route". Retrieved February 18, 2015. ^ "Hayley Williams Guitar Hero World Tour Behind The Scenes". rockdirt.com. October 26, 2008. Retrieved 2008-12-30. ^ "Twilight Soundtrack To Include Muse, Linkin Park And, Of Course, Robert Pattinson". mtv.com. October 6, 2008. Retrieved 2008-12-30. ^ "Official Stephenie Meyer Website". ^ "Paramore's 'Twilight' Song 'Decode' Premieres On Stephenie Meyer's Web Site".